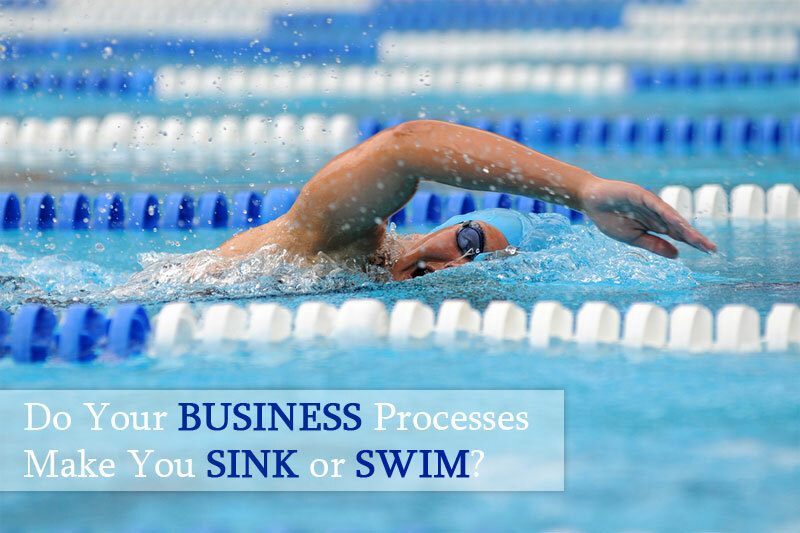 Do your business processes make you sink or swim? Blog Do your business processes make you sink or swim? How did you spend your day yesterday? Did you spend time developing strategies for how you can grow your business? Did you call 10 prospects who might be a good fit for your services? Did you invest time in coaching your successor to allow you to grow into your next exciting venture? No? Sound familiar? But have no fear, there is a better way! That better way starts by looking at your business processes with a critical eye. One of the tools I like to use to do so is the swim lane diagram. Just as it sounds, the diagram looks like the horizontal lanes of a swimming pool. Each lane includes the tasks performed by a single role in the organization. More than one person may fulfill a role and when they do, their tasks are captured in that lane. Mary and Joe may both work the front desk during different shifts, in which case we would combine them into the single role called “Front Desk”. Even if you fly solo, you will still have lanes for Clients and the various Partners, Suppliers and Vendors with whom you interact. It’s a great way to get things out of your head and onto paper so you can take a realistic look at how you are spending your time. We also include a lane for technology. In complex processes we may have a lane for each type of technology (e.g. CRM Tool, Accounting Tool etc.). For simpler processes we combine every step into a single lane called, not surprisingly, “technology”. So if a role performs an activity that accesses a system, we would show the activity initiated by the role and then dipping down into the activity undertaken by the system, the response and then back up to the role to deal with the response. Below is an example of the format of a swim lane diagram. My objective as I look at a client’s processes is to identify how we can simplify them and how we can apply technology to automate activities. The goal is to save a client time in their business and make them more efficient, while optimizing the experience of their end customer. We begin by setting a vision for their desired customer experience, and challenging the client with ways in which they could make it better. This is one of those “forget your current business limitations, what experience do you want your customers to have with you” kind of exercises. Then, by using a swim lane diagram to describe how their business flows today we have a wonderful visual way to describe the interaction between work and software used to support work. I look for ways to eliminate steps or change their order to improve efficiency and customer focus, and then look for categories of technology that can assist with automating repetitive steps. We then together come up with a plan to make the changes and implement the tools and support the client in implementing those changes and making sure they stick. I have a mind for process so inefficiencies tend to jump out at me, (which is why going to the DMV typically drives me nuts), but you can do this for your own business as well. The format of the swim lane diagram is relatively simple, and there are several online tools you can use to build them. My personal favorite is Lucidchart. The key is to stand back and take a critical view of your processes to make sure that they are helping your business to swim like an Olympian!